A quality softshell is a crucial piece of kit if you want to remain warm and comfortable whilst cycling in the winter months. To perform well, a softshell has to be windproof, but also breathable, allowing your perspiration to escape. 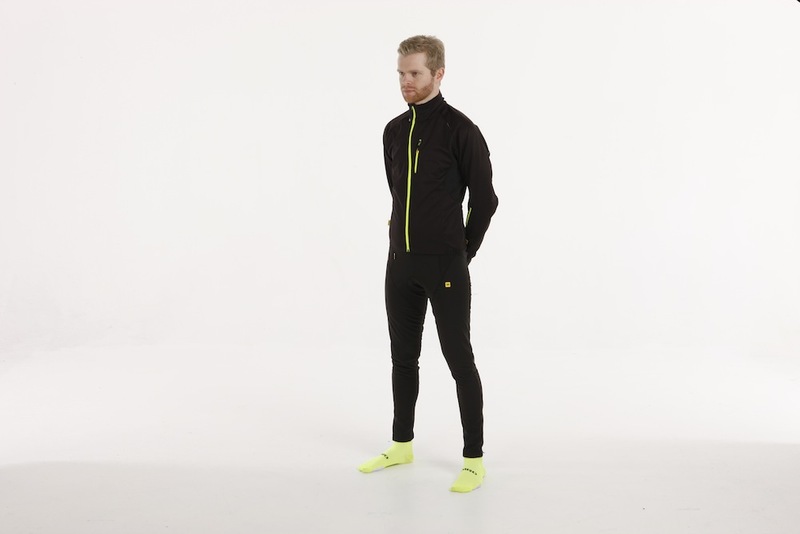 So how well does the Mavic Sprint Thermo Jacket perform? You can expect to see more of this jacket in the coming year as the team formally known as Rapha Condor JLT adopt Mavic as their clothing sponsor for 2015. This jacket is aimed at riders who want a quality, technical jacket that also features elements of style and design. A size medium fitted our 70kg 6’1 tester well. The jacket features three pockets on the rear, which we found to be plentifully deep and easy to access. In addition, there are also two useful zip pockets, one on the chest and one on the rear, which are handy for objects such as keys and phones. 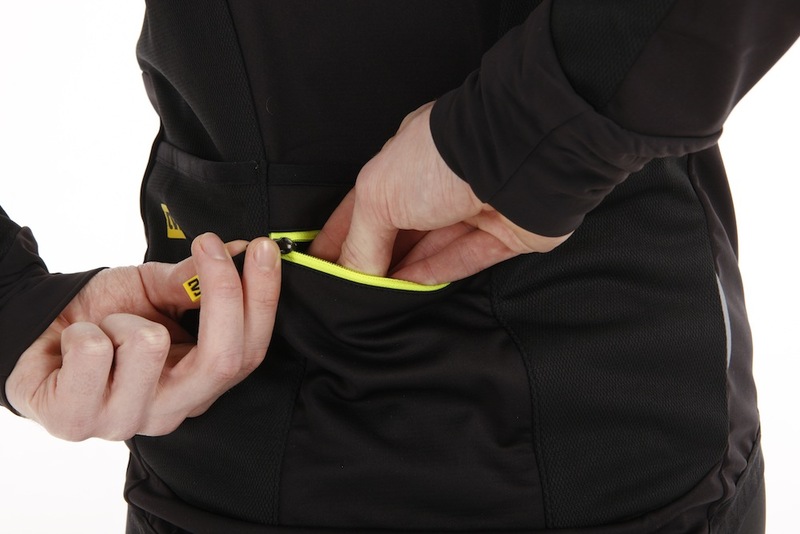 The zipped pockets are useful and we like the fluorescent colouring. The zips all feature a fluorescent green, which adds a subtle element of hi-vis and is a nice aesthetic touch. The front zip is described as ‘ergo’ which means it slants across your body. Whilst we remain sceptical about the improved fit this is claimed to offer over a standard straight zip, there is no doubting that it looks attractive, especially when it is made a feature of the design, with the fluorescent colouring. >>> For 10 of the best winter jackets, click here. So how well does it perform? This jacket is very good, we have been putting it through its paces during much of December and the Rapha Festive 500, remaining warm throughout. The fit is described as close and we can confirm this, with the example pictured being a size medium on our 70kg, 6’1 tester. There has been a large variety of weather this December and subsequently the jacket has seen action in temperatures ranging from –1ºC to +15ºC. On the coldest of days (-1ºC), wearing a long sleeved base layer and jersey underneath provided adequate warmth and during warmer days (10ºC+), a short sleeved summer base layer was all that was required to be worn under the jacket in order to remain comfortable. >>> For our essential guide to Winter clothing, click here. The arm vents are an attractive looking touch, but we haven’t found ourselves using them a great deal, overall the jacket breathes well. 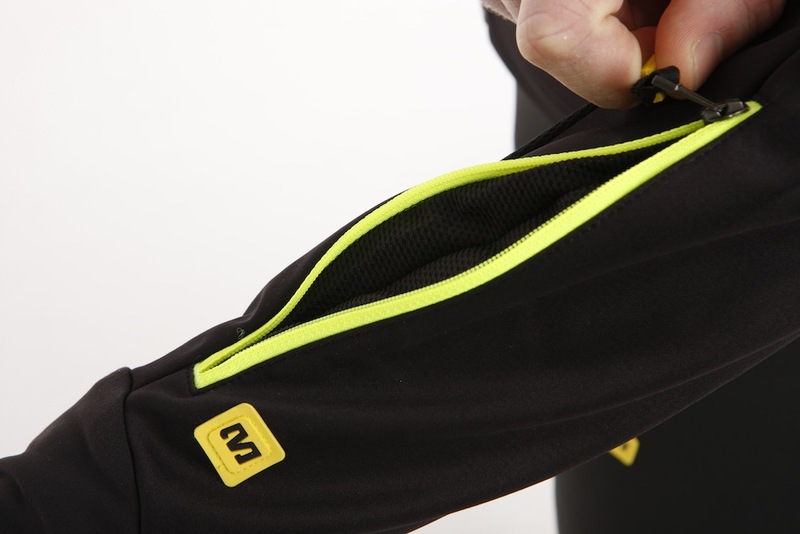 However, the ‘ergo cuffs’ are a great feature and ensure that you never have a gap between your sleeve and glove. If you have ever experienced this gap you will appreciate how useful this is when the cold really bites. One downside we experienced was the lack of water proofing. Manufacturers often compromise breathability for waterproofing/water resistance, so we can understand why this garment isn’t designed to be waterproof. However, as technology advances, we are reaching a point where we should demand more from our textiles. The Gore Windstopper fabric, found on competing jackets is highly breathable and water resistant, thus setting a benchmark to which others should aspire. This jacket doesn’t claim to be water resistant, so we can only knock off one mark, but if it was, it would be much more versatile and more than justify the £155 RRP. Overall, this is great winter softshell. It breathes well, keeps you warm, is comfortable and looks great. A lack of water resistance means that the jacket must be paired with a rain cape or hardshell in wet conditions. It does however lend itself to a wide range of temperatures.